Join us for a special celebration of Frida Kahlo on July 6th at Cargo. This unique fiesta for the "Gran Artista" is inspired by her famous dinner parties otherwise known as días de los manteles largos which translates to "the days of the long table cloths". Frida's style of cooking and entertaining was as vibrant and colorful as her painting. We’ll be recreating one of her famous soirees with the help of Feastly, Leah Jorgensen Cellars, Nicky USA, Mezcales de Leyenda and the talented team at Cargo. Ticket price includes a special cocktail hour presented by Mezcales de Leyenda, live music from the renowned mariachi vocalist Edna Vazquez followed by a 4-course dinner and wine pairings from Leah Jorgensen Cellars. Modifications politely declined. If you have a severe food allergy, please contact us via e-mail at elizabeth@chuparrosa.com. White fish marinated in cilantro vinaigrette served in cucumber cups. 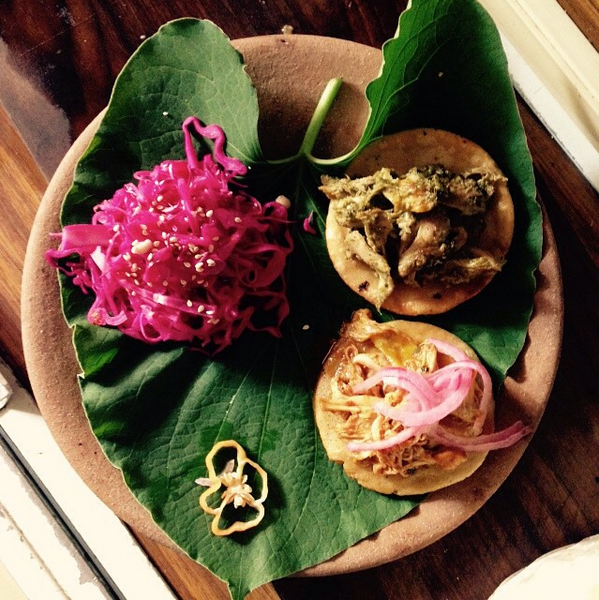 Mole verde, caramelized onions, and pork shoulder or squash served on crispy tortilla. Marinated lamb with chile pasilla rub wrapped and steamed in banana leaves with sweet potatoes. Avocado chipotle mousse with smoky chipotle chile and agave. Emperors in the past used to call on cooks from many regions to come serve small bites of their local dishes so that the emperor could experience many regional tastes and flavors in one meal. We call this supper Plato Emperador to share with you a combination of some of our favorite flavors and styles of various regions in Mexico. For Menu & full event details/tix click FEASTLY! If you love to host at your home and provide an experience to your friends/family, but want us to do the work, let's chat! All you have to do is fill the seats, we do the rest. A Your guests will be charged for their seat, and we take care of that as well so the money doesn't even pass through your hands. We offer this as a way to host a dinner with friends without the cost. We create an invite for you to send to potential guests. We decide on a menu and budget, if you want a 'cooking demonstration' (it's very informative and fun as you watch Hector's process and then eat together) or a sit down dinner. It's a minimum of 10 guests, maximum of 30. B You work with us on your budget and you foot the bill. We decide on a menu together, if you want a 'cooking demonstration' (it's very informative and fun as you watch Hector's process and then eat together) or a sit down dinner. It's a minimum of 10 guests, maximum of 30. We offer Mezcal Tastings combined with the hosted suppers as well, a really fun way to learn about the beautiful artisanal process of making mezcal. Check out more information here about hosting a Chuparrosa, or Contact Us to ask any questions, or to start creating your amazing supper! $60 purchase tickets in our Shop. Our first Supper was such a success at Mt Tabor Roastery, we are excited to announce it will be a monthly event! This event will be from 5-8pm, a more casual supper setting, the table will be filled with the menu below from 6-8pm. Doors open at 5pm! Beer and Wine will be available for sale during the event. Gift a seat to a friend! Simply fill out the recipients' info at checkout with a special note. Esquites-Mexican Street Corn Kernels served in a cup with spices, homemade mayo and queso cotijo, a Mexican street food staple! Our entire menu is naturally Gluten Free. Our dear friends Emily and Michael, who are the masterminds behind the insanely delicious tastes at Mt Tabor Roastery, have been in the biz of coffee for quite some time. They recently came over for dinner, and we heard hours of incredible stories about their experiences in this world, and the intricacies of doing this work with the best intentions, the best quality, fairly (for real) and doing it right. To learn more about them and their product, visit their informative site, and learn why they are different from most coffee roasters, and what makes them the BEST. No joke. Even better, just hop on down there over the weekend (hours are Saturdays and Sundays 8am-2pm) and have a sip, you won't regret it. 6922 NE Glisan Street, Portland, OR. Our first pop up supper at this lovely intimate and cozy space is November 11th! Seats are limited. Tickets for this supper are $45! Visit our shop to view the menu and purchase your seat! Or buy tickets at the coffee shop during hours listed above. Every week when we go to the store we always find ourselves adding the same exact things to the cart. It's because we like these things, but we need to change them up a bit. We don't tend to follow many new recipes- we like to use what we have, or when we see yummy seasonal veggies, chiles, herbs we grab them to make salsas to add to our staple dishes. If you are at all similar, try shaking things up, simply, with creative salsas/sauces without feeling like you need to spend a ton of time exploring and following complicated recipes! No need to measure-throw some cilantro, olive oil(approx 1 cup), splash of white vinegar, lemon or lime, jalapeño or serrano chile (to taste), garlic (we like garlicky-3-4 cloves, but add to taste), salt, into your food processor/blender, and voila! We like to add this to baked or sauteed chicken-or best of course on the grill, pulled from bone. If you are looking to save time, grab a rotisserie chicken and shred it. Throw the chicken on some tortillas (our favorite local pre-made tortillas are Three Sisters Nixtamal. Add the cilantro pesto and you've got yummy dinner. Mezcal Tasting & Plato Emperador Food Experience March 4th 2017! Don't miss this unique and fun experience....Hosted by artist/interior designer Trish Grantham in her amazing home in North Portland (www.trishgranthamdesign.com), chef Héctor Guerrero from Mexico City brings you a night to remember. To learn more about Héctor Guerrero, read here. Seats are $90 per guest and are limited! To hold your seat, please make your deposit here. We are so excited to share this evening with you! The tasting and dinner features 3 special mezcals from Oaxaca, along with 3 plates (detailed information below). Additional mezcal, beer & wine will be available for purchase. Please reach out about dietary restrictions, we are happy to accommodate. While living in Oaxaca, we spent equal time learning from and collaborating with artisans, as well as with families traditionally distilling artisanal mezcal. It was beautiful and amazing to see and learn about this process, the amount of work involved, and the passion of these families who are so proud of their product. 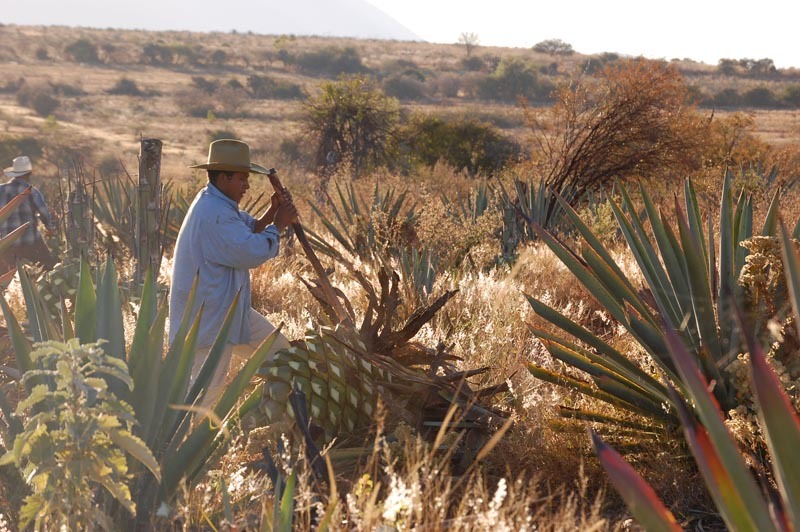 We want to share this experience and information with you, and support this artisanal industry hoping to help in protecting this tradition from the same exploitation the tequila industry experienced. We bring you 3 different samples of a mezcal made by a distiller that we grew to love quickly while living there, that had it's place on the table to share with friends for many meals. One is a very special small batch mezcal that contains Espadin mixed with Semi-Wild Bicuishe, grown at about 5000 feet, fermented in cypress vats. The success and unique flavors of mezcal depend on the combination of the altitude and soil in which the varieties of maguey plants are grown, as well as the form of distillation, tanks of fermentation....and the hand of course. Inspired by pre hispanic traditions of the luxurious meals of Emperors, Héctor brings you his version of this elaborate tasting of Mexican food. In the past, Emperors wanted to taste exotic flavors of 'chefs' using ingredients and styles from various regions. It turned into a sampling of bite size exquisite tastes all in one meal-much like tapas we eat today. Please contact us with any questions. Our Chuparrosa suppers have been such a success-always a lovely fun mix of people, all new friends by the end of the evening. Thank you always for your support. Cash or credit card graciously accepted after the dinner for balance and additional purchases. We are so excited to present our first salsa class in Portland! Come alone for an informative and fun social gathering, or come with friends. Only 6 spots so grab yours asap! At our house, we cook very simply, with delicious seasonal ingredients, and salsas. Mexican cooking is all about amazing salsas. Completely transform a simple egg breakfast, a bowl of veggies, or a beautiful piece of fish or meat by adding any one of the salsas you will learn to prepare in this class. They are easy to prepare, and completely alter any meal. All of our salsas happen to be free of gluten, vegan and vegetarian. In Mexican cooking, there are many ways to prepare salsas, three of which are raw, fried (with oil), and grilled. In this class Hector will share with you salsa preparations for one of each technique, but also additional tips to make delicious dressings and oils from the same ingredients. Hector will start with one of our favorite staple raw salsas, Salsa Verde. One of the best party salsas, but also transforms many meals at home. He will then show you how to use the juices of this salsa to create a versatile dressing. Then you will learn to make another favorite, and delightfully complex flavorful salsa using fried chiles with fruit. After he will show you how to make a chile oil infusion from the same ingredients. Finally, the grilled salsa, a molcajete salsa. You have most likely seen a molcajete, they are the traditional Mexican stone version of a mortar and pestal (easy to find). There are many ways to use this tool, Hector will show you a mouth watering salsa using grilled chiles and vegetables. We are proud to collaborate with Trish Grantham (www.trishgranthamdesign.com), and will be hosting the class in her gorgeous home in NE Portland. We are excited for you to join us! You will learn so many healthy ways to completely transform your meals and dinner parties, without complicated and long recipes. Salsas are great ways to get kids to eat veggies....and you can control the heat, or easily make spicier versions of the same salsa. Please contact us if you have any questions at all about the class! We ask that you hold your seat by paying a non refundable deposit here. We kindly ask that all information gathered in our Quetzal classes are for personal/home use only, and thank you. The Quetzal is an ancient bird, native to Central America that can be recognized by its long, beautiful tail feathers and distinctive call. Considered to be a spirit guide, the Quetzal traditionally represents liberty. Ancient peoples believed the Quetzal would not survive in captivity and that it would rather die than be held in captivity. QUETZAL was born from our love of the spirit of mexico, passion for food, freedom of travel, and the beauty and tradition of hand craft. Currently based out of Charleston, South Carolina, we offer local Mexican cooking classes, Privately Hosted Supper Clubs, and personally created trips to Oaxaca and San Miguel de Allende, Mexico.